One of America's first Muslim congresswomen has vowed not to be silenced after President Donald Trump led an attack on her for controversial remarks she made about 9/11. 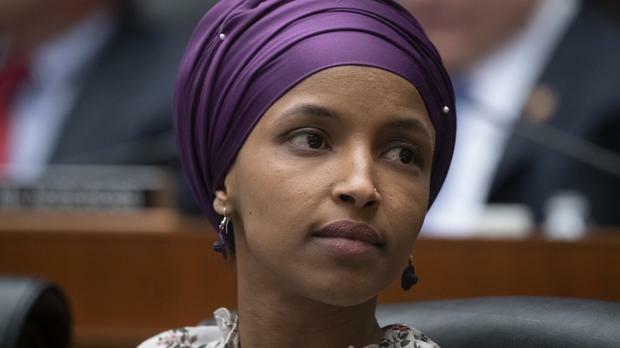 Ilhan Omar, of Minnesota, sparked a row by saying "some people did something" in reference to the atrocity in a speech last month to the Council on American-Islamic Relations. On Friday, Mr Trump posted a video on Twitter tagged "We will never forget", that featured footage of the Twin Towers in flames interspersed with Ms Omar's comments. Hours later, a man was arrested for threatening to kill Ms Omar, who came to the US from Somalia as a child refugee. Undeterred, the 37-year-old wrote on Twitter at the weekend: "I did not run for Congress to be silent [or] to sit on the sidelines. I ran because I believed it was time to restore moral clarity and courage to Congress. To fight and to defend our democracy." While most fellow members of the Democratic Party leapt to her defence, rounding on Mr Trump for pushing anti-Muslim rhetoric and inciting racial hatred, Nancy Pelosi, the most senior Democrat in the House of Representative, was notably measured. While admonishing the president, her response has also been read as chastising the new congresswoman. "The memory of 9/11 is sacred ground and any discussion of it must be done with reverence," she wrote on Twitter on Saturday. "The president shouldn't use the painful images of 9/11 for a political attack." Cory Booker, who on Saturday became the 18th Democrat to announce that he is running for the presidency, said yesterday: "To see the president use images of 9/11 in a vicious, crass, disgusting way - that is so objectionable. This is what I mean about moral vandalism in our country." Elizabeth Warren, another presidential contender, said: "The president is inciting violence against a sitting congresswoman - and an entire group of Americans, based on their religion." In February, Ms Omar was forced to apologise after she made remarks regarding America's close relationship with Israel, which she implied was down to money. Mr Trump called on her to resign. When asked abut the controversy yesterday, White House press secretary Sarah Sanders condemned Ms Omar.